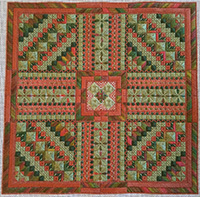 Ravishing floral design worked in crewel wool and pearl cotton using embroidery stitches as well as traditional canvas-work techniques. 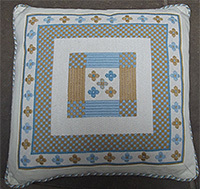 An attractive Florentine design cushion, worked on 14 mesh canvas in crewel wools. Also available as a rug. 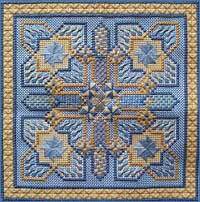 An exciting design in crewel wools using a wide range of stitches. 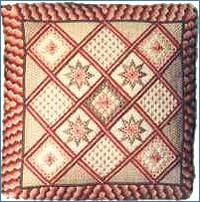 A beautiful canvas for the experienced stitcher. 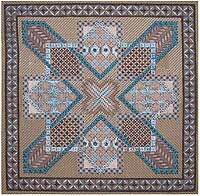 This design uses wool, pearl cotton, stranded cotton and over-dyed cotton. 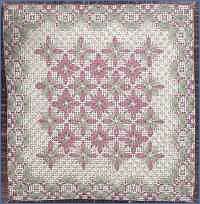 Design worked in crewel wool, stranded cotton and pearl cotton. 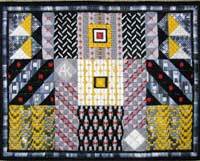 A challenging design using wool, over-dyed silk and cotton, and stranded cottons. 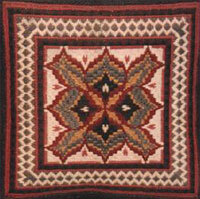 Design worked in crewel wool, stranded cotton and hand-dyed silk using a very wide range of stitches. 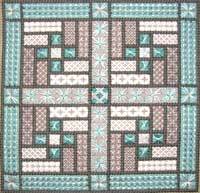 Eight different Florentine patterns in crewel wool. 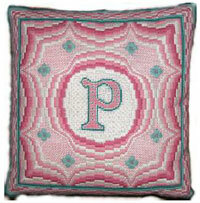 Worked in Crewel wool, with background to initial in Pearl cotton. 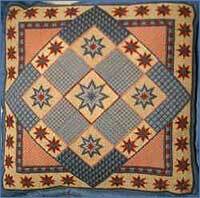 Patterns for alphabet are included. 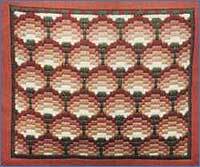 Nine columns of co-ordinated Florentine designs, worked in crewel wools. 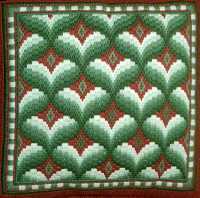 A Florentine Design worked in Crewel Wools. 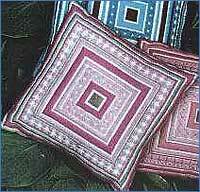 An ideal introduction to needlepoint stitchery. 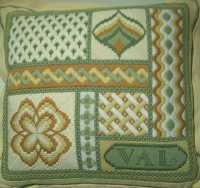 All crewel wool. 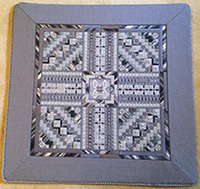 Florentine design with a border, worked in crewel wools. 14 mesh taped canvas, 16 in (41 cm) square. 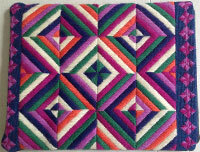 2 x 20 tapestry needles. 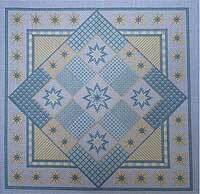 Perfect for stitchers with little or no experience, worked in crewel wool and pearl cotton. 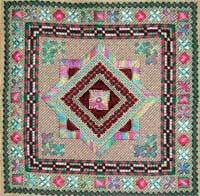 Design with central area of Bargello Flowers surrounding a name and date and a border of hearts. 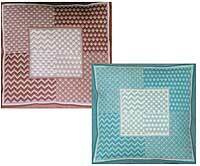 Two colour schemes available blue or pink. 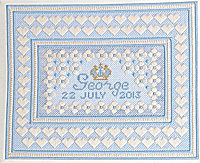 An exciting range of different stitches with a Florentine border, worked in crewel wool, stranded cotton and pearl cotton. 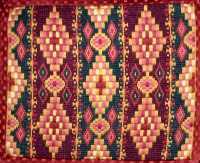 Design adapted from a hand-woven silk from central Asia. 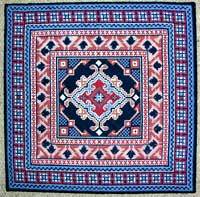 Worked in Crewel Wools. 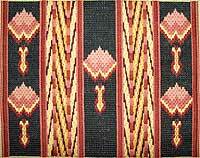 Design makes a pair with Ikat Damas. 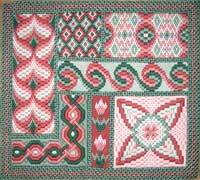 Worked in crewel wools. Ideal for using up all those left-over wools. Exciting design inspired by the 1930s. 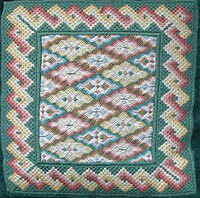 Many textured stitches worked in Crewel Wool, Pearl and Over-dyed Cotton. 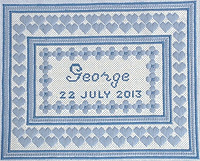 The design co-ordinates with Ragtime. 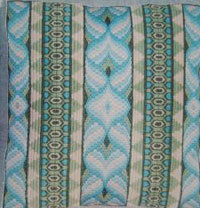 Small panel worked in stranded and pearl cotton, with hand-dyed silk. 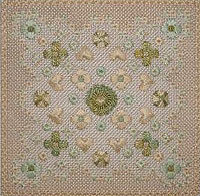 Panel worked in a wide variety of stitches with crewel wool, pearl cotton and hand-dyed silk. 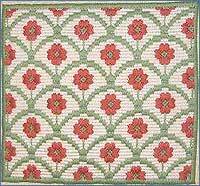 Florentine design, all crewel wool. 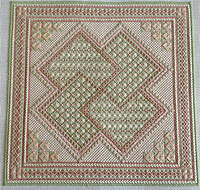 A design taken originally from a Victorian Sampler, in crewel wool and pearl cotton. 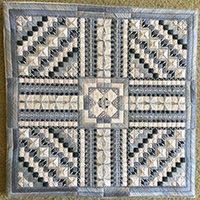 Finished size approximately 13.5 inches, 34 cm square. 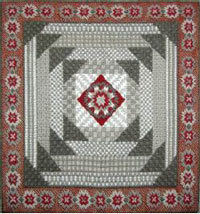 A design taken originally from a Victorian Sampler, in stranded cotton.